Kindergarten parents/guardians along with their children are invited to visit the building/classroom and drop off their child’s school supplies on Thursday, August 30, 2018 at 9:00-9:45AM. First grade parents/guardians along with their children are invited to visit the building/classroom and drop off their child’s school supplies on Thursday, August 30, 2018 at 11:00-11:45AM. 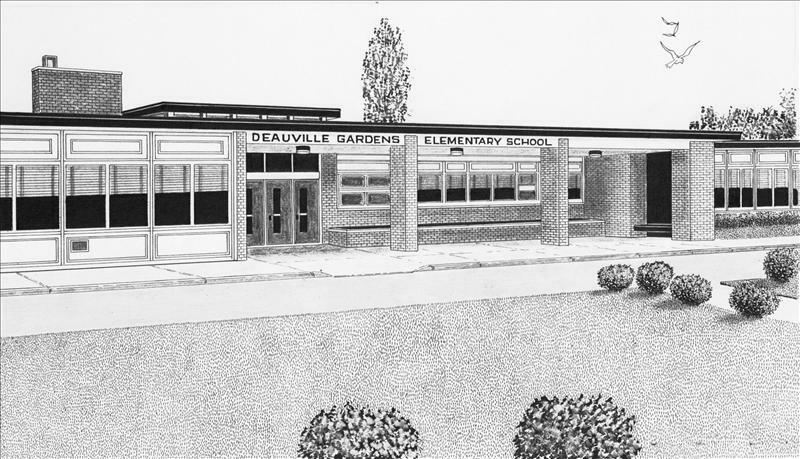 Deauville Gardens West Elementary School serves approximately 450 students from kindergarten through grade five and provides a variety of experiences to support the social, emotional and academic well-being of students. The collaborative atmosphere, well-trained and highly qualified staff and student-centered philosophy foster an environment which truly benefits children. In order to provide a meaningful and effective education, maximize student growth and meet the requirements of the Common Core Standards, a variety of programs and approaches are utilized. Guided Reading is the foundation of the Balanced Literacy program that is embraced in order to challenge each individual student at his or her appropriate level. Math is taught by allowing students to experiment with concepts and create their own understanding of material. In addition, a number of before-school programs and clubs present students with opportunities to explore new interests. At Deauville Gardens West, we recognize that a strong partnership between the school and home is essential for a positive and productive educational experience. Staff members work closely with the PTA and families to provide enriching experiences for students both inside and outside of the classroom. Fifth-graders in Jodi Embleton’s art class at Deauville Gardens East Elementary School are creating unique character portraits modeled after the works of contemporary artist Yago Partal. The Barcelona-based artist is known for his work featuring animals in people clothing. The students used a burnishing technique with colored pencils to create their own individual animal portraits. As part of their study of Native American culture, fourth-graders at Deauville Gardens West Elementary School made their own wampum belts. They learned that the Native Americans made the belts out of white and purple shells and used the wampum as a way to record stories and historic events. After the students were done designing their own unique belts, they created a storytelling group to share their stories. Students in William Jaack’s fifth-grade class at Deauville Gardens West Elementary School are learning about humans and their effects on the earth’s system. They were asked to make posters about whether humans are helping or hurting each of the systems for either the atmosphere, hydrosphere, biosphere or geosphere. They shared their findings with the class. Fifth-graders in Jamie Alpi’s class at Deauville Gardens West Elementary School are learning about the nitrogen cycle. As part of their lessons, students moved around the classroom through a cycle to investigate how nitrogen moves through the environment. Students started at different stations, read the station card and completed an activity sheet. They cycled around the stations until they completed their diagram of the nitrogen cycle. It was a morning of community pride, as Copiague Public School hosted its annual Community Summit for more than 600 invited guests on March 16. Among those in attendance included the Copiague Board of Education, district administrators and staff, representatives of community organizations, local politicians and students and their families. Echoing Mr. Sales’ message of success, Superintendent of Schools Dr. Kathleen Bannon presented her annual State of the Copiague Public Schools. During her address, Dr. Bannon provided an overview of district highlights, including various student accomplishments, expansion of the pre-K program and the completion of the community-approved capital project. She also provided an update on the budget process and the district’s funding. With the theme “Copiague Students Soar,” the summit also featured student performances, spotlights on elementary, middle and high school programs, clubs and projects and an introduction of the Class of 2019 top ten students. Deauville Gardens West Elementary School held a family literacy night celebration on March 6 themed “Stomp, Chomp and Read.” Students in grades 3-5 acted like paleontologists and searched for dinosaur fossils in a sand kit and a dinosaur egg kit. They then researched facts about their fossil on Chromebooks. Students in grades K-2 listened to dinosaur stories and made dinosaur puppets. All students received a dinosaur book to take home. Thirteen Copiague School District students were recognized at the Feb. 11 board of education meeting by members of the Knights of Columbus in the organization annual poster and essay contests. The poster contest, now in its ninth year, had a record number of entries at 104 from Copiague student-artists. The goal of the contest is to raise awareness about drug and alcohol abuse. The winners, who received certificates and prizes were: Deauville Gardens West: Carolina Acosta-Rivera and Sandavi McCants; Susan E. Wiley: Ivanna Gonzalez Rodriguez; Deauville Gardens East: Kiarisleidy Baez Fabian; Great Neck Road: Jazlyn Batista, Justin Martinez Canas and Rayana Gooden; Copiague Middle School: Jayden Risch, Joseph Risch and Eliud Bonilla. Three Copiague Middle School eighth-grade students were presented with certificates and prizes for their essay contest entries. The contest is in its third year and essays are focused on religious freedom. Paulo Gonzalez was the first-place winner. Diana Carbajal placed second and Ari Chervony was named the third-place winner. Click here to see the school’s participation in the Great Kindness Challenge.